This is the highest rated product on my entire blog. I have struggled for years to find a self tanner that works, and doesn't take 6 months of pre-planning. That wont turn my hand orange and look awful on my knees. Something that looks natural and works. Now it's here. The packaging is fun and bold (as is the companies M.O.) and it comes with a little plush applicator that clicks into the lid. The applicator is soft and easy to use and I love it! The smell is tropical but it is very subtle. 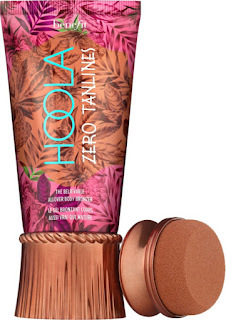 It has a great even coverage and leaves you with NO tan lines! I love that! It isn't streaky or messy and it is build-able, so if you want to go darker wait a few minutes and apply again! It is also hydrating and doesn't leave your skin feeling dry at all. It is so easy to use and is perfect for your next pool trip or beach party. Ulta's 21 Days of Beauty is here! This amazing sale has incredible deals on high end brands that usually don't go on sale and don't work with other coupons that Ulta offers! On top of the incredible deals shipping is free on all beauty steals for Platinum Members. Here I am going to list some of my favorite deals, but you can click here to see the full layout and all of the sales! The sale is on NOW and began yesterday! So check in to make sure you don't miss anything. Buxom Full-On Lip Cream is packed full of pigment and adds a glossy sheen to any smile. 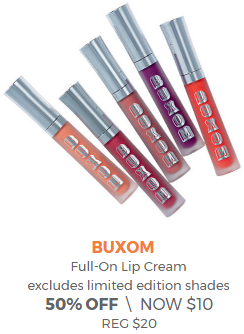 It doesn't have shimmer but contains Buxom's infamous plumping formula to keep your pout looking full. The Perfect Brow Pencil is now more accessible than ever! Every makeup artist's dream is on sale for only $12! 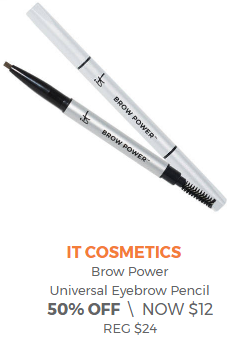 Brow Power is a universal pencil that has a super neutral shade and can create light or dark color pay off depending on the pressure you apply. This can help you nail the ombre brow effect quickly, especially with a brow grooming tool on the other end! All three of these deals are to good not to mention! Becca's back lighting primer is incredible! I mean it's from Becca so what more do I have to say? 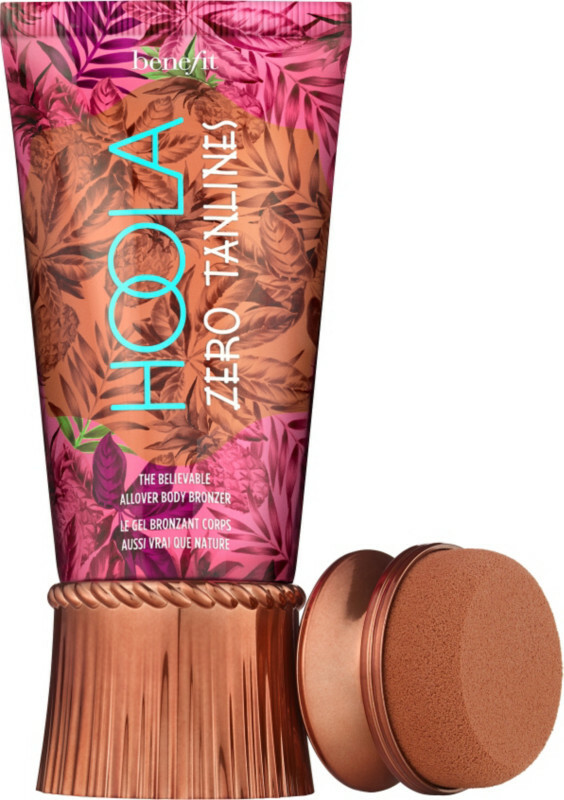 It adds hydration, keeps your foundation in place and gives you an incredible glow. The dermalogica skin care sample sets are a great value already and are a steal at this price! 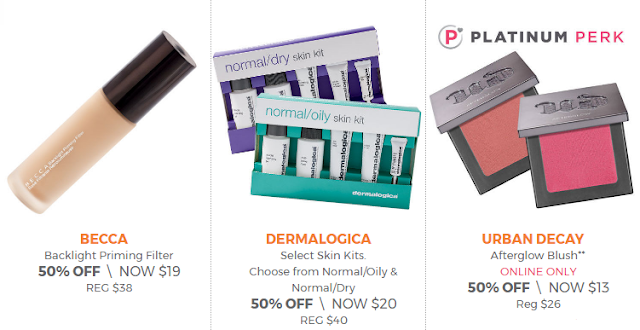 And congrats to fellow platinum members because the ultra silky and pigmented Urban Decay Blush is also 50% off (online only, BUT free shipping for us platinum members)! 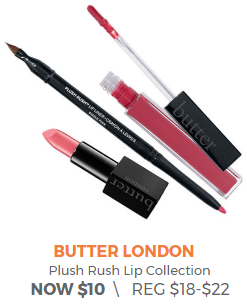 Butter London's Plush Rush collection is dynamite! It includes a lipstick, lip gloss and lip liner. The liner comes with a lip brush on the cap! The gloss isn't sticky and is super pigmented, and the lipstick is a slam dunk! It is long lasting and I love it (I already own 4 shades)! You can't go wrong with any of these gems in your collection. And we couldn't leave out the best deal on the last day! 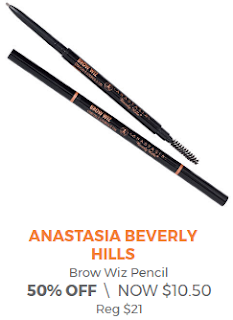 The infamous Anastasia Beverly Hills Brow Wiz pencil is at a coveted 50% off! Even beauty gurus and pros get 40% off of ABH products with their pro discounts and Ulta is topping it! Stop by early because I expect this deal to fly off the shelves! BONUS ALL FIONA STYLES PRODUCTS ARE 50% OFF! So first things first we will start with the packaging. It got a 4 because it is sturdy and dow look nicer to me than a drug store brand. However the label and the font on the label is outdated and cheap. The label comes off very easily and is not printed onto the bottle either. I also don't like that the cap doesn't come down all the way to meet the bottle of product when screwed on, so you can really easily get dirt and stuff in the crevices which looks yucky. It looks nice overall, but isn't immaculate so I gave it a 4. When I shell out $25 on a lipstick I want it to look high end. So let's talk about applying this stuff, one thing I did not rate is value. I choose not to because people may disagree with me on this. Why does this go hand in hand with application? Because you have to buy three products in order to use this! In order to use LipSense you have to purchase the color, the glossy coat and the remover. It is REALLY hard to take off without the remover, and it is very drying without the gloss coat. You really do need all three. So that makes theses $55. You can argue that that isn't the coat per color, but you do end up reapplying the gloss throughout the day and run out of it much quicker. This means you do have to replace it frequently. There is an image going around about how Lipsense has the best value when you consider the cost per ounce of product. That is true if you only factor in the color. However you have to wear at least 3 coats of one color to get vibrancy, where I only need one coat of Urban Decay, Kylie Cosmetics, Ofra or several other liquid lipstick brands. So let's get back to putting this stuff on, this stuff stinks! It smells like alcohol and is pretty strong. So that explains it's scent score. Now we get into the "application and wear" portion. The first time you apply this product it BURNS. Apparently it is chemically exfoliating your lips so it can have a better molecular bond to them. So I did get myself to wear the same color multiple days in a row (so not me!) and it stopped burning and stinging after about 5 days. However after wearing a different brand for 2 days, the stinging was back! To avoid the stinging altogether you would have to completely switch brands, which I am not going to do. So then you have to apply multiple layers of your color in order to get them super vibrant. I have two shades, a shimmer that applied pretty nice, and a matte shade that was a pill to use. It was super patchy and I was very good about using it a lot to have my lips fully exfoliated as well as wearing the gloss to bed to help condition my lips over night (which the distributor recommended). Nothing helped. Not shaking it more, shaking it less, applying it differently. PLUS it is a daunting task. With my other products I throw on a clear lip liner and then paint on my shade once and I am done! With LipSense I had to carefully put on the color 3-5 times, fill in the patchy spots as best I could and then finish with a gloss. And even with all that work the color still feathered so I ended up using my liners anyways adding another step to the process. As far as the wear goes the color lasts unless you eat something greasy, because the grease will break down the color. Then if you do not wash your lips super well the color will not apply well after. It did feather as well (as I mentioned before), but other than that it lasts all day. So if you aren't eating greasy grub it will stay in place all day, so it gained 2 points do to that. It's biggest feature that has made it so popular is it's kissability factor. The lip color won't end up on your mans face, collar, or anywhere else. The same can not be said of the gloss. But the gloss is shear, so it is not as big of a deal. My hubby still prefers me to wear other brand on our date nights because he hates the sticky feeling. Regardless I still think it is considered kiss-proof. So all in all, does it work? Yes. It is a kissproof long lasting lip option. Will I buy it again? No. I need something easy to use that smells good and is comfortable. This doesn't fit that bill. I am slightly obsessed with this one. Powder play is amazing! It comes in a small bottle with holes in the top. You part your hair and shake a small amount of this powder/dust in your hair and then work it through. It lifts the roots adds a ton of texture and gives your hair an effortless look. The packaging is effective and fun, it adds a lot of volume and lift as well. It gives a ton of texture and separation for a fun and funky look, but it can be tamed and controlled. It's average as far as how long a bottle will last, and of course it entirely depends on how much your put on each time. As far as wear, after about 2 hours my hair starts to "deflate", but all I have to do is run my hands through it a little and it's right back up and full!